This was my 17th book of the year but it took me a week to read because I just couldn't get into it. I was really busy - I had a writing deadline and then I went to Swansea to visit friends for the weekend, but even so. It seemed to take me so long. 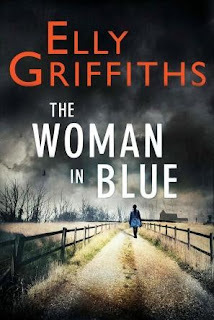 This is the 8th book in this series by Elly Giffiths, featuring archaeologist Dr Ruth Galloway and detective Harry Nelson. I really like the books, they're both really likeable main characters and the supporting characters are really good too. I like the stories as they're a mix of crime drama and religious symbols and theories. My first degree was in Theology and Religious Studies and it's something I really enjoy. I've read all the previous books so I was looking forward to this one. However, I didn't feel like it lived up to previous ones. There wasn't as much crime or tension there, and the religious elements were really sidelined and unimportant. The will-they-won't-they sexual tension between Ruth and Nelson is getting to be frustrating, too. I gave it three out of five which is low for one of these books. I'm hoping that the next one, The Chalk Pit, is a return to form.